Hello Sunshine! I'm super excited to share with you a new fragrance that doesn't just appeal to the millennial in me, but also, to my sexuality. I'm talking about the first ever gender-free fragrance, by no other than Calvin Klein. The CK2. 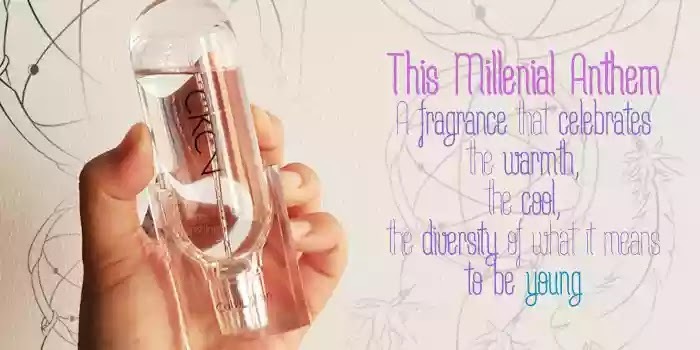 Twenty two years after the iconic launch of the world wide hit CK one, Calvin Klein makes a come back with a new gender-free scent that doesn't just embody the energy and fluid spirit of millenials... it also celebrates it. Watch the video below for the official CK2 ad: a celebration of today's youth who is bold, free, diverse, and is all about connection. So since the official launch of CK2, I've been wearing the scent--even took it with me to my #VisVacay trip... and it's amazing how many compliments I get with my perfume. Like, you know you're sporting a great find when you're not just in love with your fragrance, but also, other people too! Especially in the office, who is an office filled with millennials, I get asked a lot about my perfume. One time, I would just pass someone and she'd be like, Ano yung mabango? Ikaw ba yun??? To which I'd be proud to admit that yes, I smell oossuuumm! I think CK2 really captures what millenials love. Proven and tested by how much I love the scent--and also by the reactions of my peers. It's such a dynamic scent that can truly suit anyone. It's warm but cool. It's fresh but also complex. I can wear it if I want to smell great while enjoying an active day outdoors, or if I want to get up close and cuddle at night naks. The CK2 line is now available in the Philippines, with price points: 100ml Php4,298; 50ml Php3,198; 30ml Php2,498. For more information about the global campaign, visit calvinklein.com/ck2. For international perfume fans, you can get your own CK2 here.